Mardi Himal trek is one of the preferred trekking trails in the Annapurna region. This trek is preferred especially by those trekkers who would like to explore the scenes of majestic Himalayas and the rich natural beauties, blend of culture, lifestyles of peoples living in the high lands. The Mardi has been named to the long ridge of the southern slope of Mt. Machhapuchhare, popularly known as fishtail, the most triangular shaped ridge and its summit that form the westerly lower slope of mountain. Its great skyline is seen even from Phewa lake at Pokhara. It is situated to the most southerly high point of Mt. Annapurna massif, around these appears majestic grouping of mountains in the central Himalayan that includes five of the 12 highest mountains in the world, all these awaits to this route. Mardi Himal Trek is designed for those trekkers who are looking for a fresh trekking trail that offers you captivating views of mountain ranges, rich vegetation along with the culture and lifestyle of the ethnic dwellers then this is just the perfect one for you. While having trekking to the Mardi himal, you will have numerous choices for trekking and hiking. The length of the trek very much depends upon the requirement of the tourists that how long they want to spend from five-day in short to two weeks. Mardi Himala trek begins at Suiket Phedi nearby Pokhara and climbs up to Dhampus with stunning views of Machhapuchare (6997m) and the Annapurna Mountain ranges. This is truly a private trail, which is considered to be one of the unique trails in the Annapurna region. For the first few days, you will follow the uphill trail as the trek winds along the ridge through forests of birch, rhododendrons, hemlock and pines and finally brings you right in front of Machhapuchare or fishtail and also to the Annapurna South with Mardi Khola river winding its way through the valley thousands of feet below and making excursion around you will follow the same way and end at Pokhara and fly back to Kathmandu. 03 Days DRIVE TO POKHARA BY TOURIST BUS, 6-7HRS. 04 Days DRIVE TO PHENDI AND TREK TO DEURALI 2100M, 5HRS. 05 Days TREK TO FOREST CAMP 2500M.6HRS. 06 Days TREK TO HIGH CAMP 3550M. 4HRS. 07 Days EXPLORATION DAY, 7HRS. You will begin your day with slow and through the series of steep rocky ascend to Mardi himal base camp 4500m. 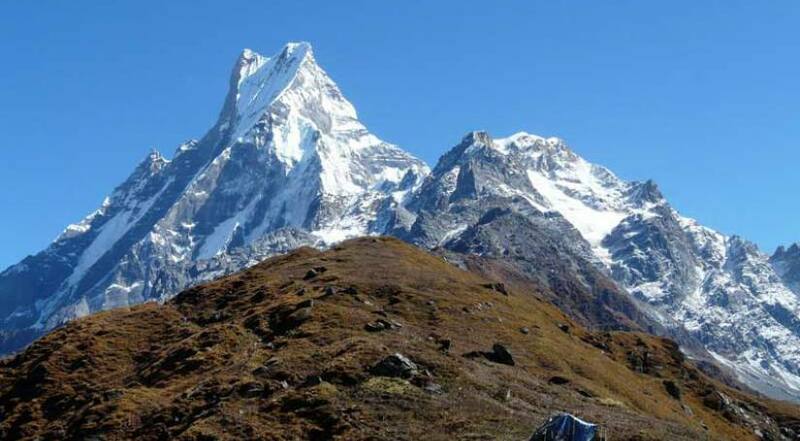 This altitude is the highest of whole Mardi himal trek which offers magnificent view of 14 mountain peaks including Annapurna I,Mardi himal, Gangapurna, Gandharba chuli, Fishtail and hiuchuli. After enjoying the view you will descend same way down to high camp. Overnight in high camp. 08 Days TREK TO SIDING 1700M. 6HRS. You will begin your day with most precious sunrise view and have breakfast then descend to Low camp. You will continue descend through a beautiful rhododendron forest to Siding 1700m. Overnight in Siding. After breakfast you will start the trek slightly up and flat passing Kalimati to village of Ghalel. Ghalel is small village with teahouse and home-stay where you will have lunch. Then trek continues crossing paddy field to Lwang. Lwang is a traditional village with ACAP office, temple, stupa and tea garden. Overnight in Lwang. You will begin your last day trek with visit to green tea garden and view then along flat trail via farmed land following the river get at Hemja kot. Here, wonderful Mardi himal trek ends and drive to scenic valley Pokhara in nice comfort hotel. In the evening, dinner will in near lake side. Overnight in Hotel. 11 Days DRIVE TO KATHMANDU BY TOURIST BUS 6HRS. In the morning, you will drive along the Prithivi high way to Kathmandu by tourist bus.You will cross the Trisuli River (famous rafting river) and cable car station. After a six hour drive, you will arrive back in Kathmandu with transportation to your hotel. Overnight in Kathmandu. In the Evening Himalayan Joy will host as a farewell dinner in the typical Nepali restaurant. Drive back to hotel.